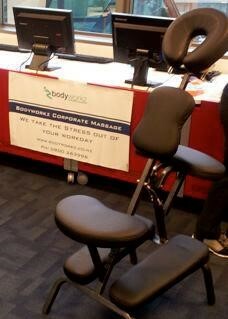 "Huge thank you to Bodyworkz and the wonderful team who gave our students some well-deserved stress relief! We’ve had fantastic feedback thus far so will most definitely be booking in for something similar later on in the year! Thank you again!" "I just wanted to say a big thank you again for helping out with our promotion. We’ve had some great feedback from the workplaces that we have visited. It’s also great that workplaces want to continue to use you guys as well, happy we could help.Thanks again!" "Just some feedback … the staff are VERY happy. One of our guys in particular, who is a big guy, said it was the best he has had." The massages were amazing – Staff really loved it – a lot of them have never had massages before and now they are sold on them!! We will definitely be using your services again – Please pass on our thanks again to the therapist. It went fantastically today, thank you! All the clients loved the sessions, it was very well received and went down a real treat." "My team wanted to say a big thank you for sending Carmen – she was very good, polite, professional and with magic hands! I have no hesitation recommending your to our other branches..."
"Nothing but positives about the massages!! We would like to make this a fortnightly ‘thing’ for the staff if possible. Thanks so much again"
"Thanks so much for providing us with such an excellent service!" "Hi, our massage sessions went very well today, we have a lot of very happy and relaxed staff this afternoon! Could you please pass on our thanks to the massage therapist as she did a great job." "Great feedback, re the massages last week, enjoyed by everyone. Please pass on our thanks to the therapist." "The massages went really well. Please pass on my thanks to the two therapists they were great. Our staff who attended were very happy!" "The girls absolutely LOVED their massages. They said that the therapists were amazing. Next time stress levels are on the rise, we’ll definitely be in touch." "The therapist was lovely and we so enjoyed having her spoil us!" "Thank you it was wonderful! Please pass on my thanks to the therapist, I didn't get to say bye to her as I was in a meeting. Everyone was definitely on cloud 9 again so I would be keen to get her back in after the Xmas break. " "Thanks for yesterday's session, everyone has been giving great feedback, they all really enjoyed it. I have had lots of "thank you for organising it" emails and even a lovely card from one of the guys." "Everyone loved having the massages – especially given how far we walk during the week of graduation. It was 15 or 20 minutes where we could relax and forget about the stresses of the ceremonies – really well worth it.! We will look at doing it again!" "Thanks, this was great! My team started slowly but most were there in the end,loving it." "Awesome service - always with a smile!" "Thanks very much, the girls were great! Thank you so much for your help." "Thanks for coming in on such a short notice!" "The feedback from the staff were great thank you!" "Thanks for organizing this for us. It went really well and Rykie did an amazing job. The staff enjoyed it so much." "Thanks again for coming to our rescue!" "Everyone loved Sarah, and quite a few extra quickly joined in after she started. Thanks again for helping out on such short notice!" "Unfortunately I had to leave the office before Gwen, so can you please thank her for making the office a happier place today, she was very well received by everyone! Hopefully our Managers will make this a regular occurrence. Thanks again!"